How come lions don’t eat hyenas after killing them? Lion attacking a hyena. Photographer unknown. How come lions don’t eat hyenas after killing them? Some asked this and all the answers that I have seen assume that the question is correctly stated by which I mean they have presumed that lions don’t eat hyenas. But who said that? It is not necessarily true and if there is some truth in it, it’s probably due to circumstance. Hyenas are competitors to the lion. 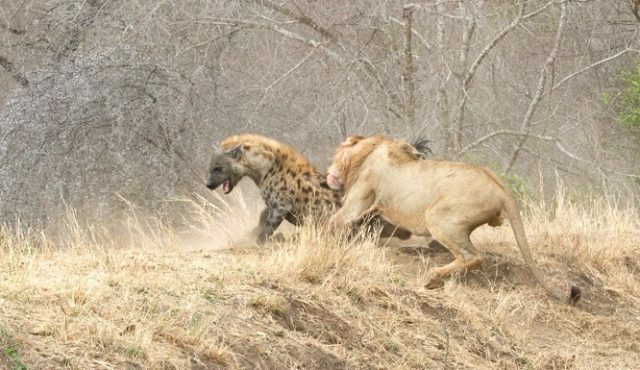 Lions suffer pretty badly with scavengers and hyenas scavenge their kills. Several lions can defend a carcass against hyenas. For instance, 25 hyenas lost their wildebeest to 2 lions. However, one lion will trot off when charged at by a group of hyenas. There is a balance there between these competitors. Lions do kill hyenas but normally it takes place in the course of eliminating a competitor for the available food – e.g. defending the lion’s kill. As the hyena is not on the list of prey items for a lion (ref: Wild Cats Of The World), it seems that lions don’t hunt hyenas as prey which is sensible because hyenas are very capable predators (dangerous) and there are easier prey items. However, I’d suspect that lions do occasionally eat hyenas if hungry enough. One person said that lions dislike the taste of hyena! I am not sure where he got that information from and how would he know? Why should hyena flesh taste worse to a lion than the flesh of an impala or zebra? I don’t believe it. My conclusion is that the hyena is not a prey item and therefore not attacked for food by lions. Accordingly hyenas are not eaten by lions except under exceptional circumstances. Home→Wild Cat Species→Lion→How come lions don’t eat hyenas after killing them? Is it possible to bond with a lion or tiger the same way as a domesticated cat? This entry was posted in Lion and tagged african lion, lion prey by Michael Broad. Bookmark the permalink. Also the hyena that the lion killed was a member of a pack that is watching all of this. If the lion eats the hyena he would be distracted from the other hyenas who would take the opportunity to attack the lion, probably from behind.